Sure Footing is a fast and frantic infinite runner about four friends saving their world from extinction. The world of Computra is under threat from the evil Ramrafstar and his ferocious minion Deletion Dave, who they seek to destroy the partitions that hold everything together. Play as one of our four heroes: Pixel Pete, Polly Polygon, Blip and Plunk as they outrun Dave across the disk sectors of Computra: to warn their friends and find a way to stop Ramrafstar before their homeworld is destroyed. Collect MIPs, avoid obstacles and overcome the challenges faced in the distant sectors of Computra. Four Playable Characters: Play as Pixel Pete, Polly Polygon, Blip and Plunk - each with their own strengths and weaknesses. Visit distant sectors of the world of Computra: Keep running to visit the historic city of K-SAN, the chilly streets of Pixeley and many other distant disk sectors in the world of Computra. Watch out for the weird and wonderful changes these distant sectors bring to the gameplay. Customise Your Loadout: Play it your way with a variety of power-ups and buffs that can give you an edge over Deletion Dave. PLUS dress-up in a variety of costumes inspired by the sectors of Computra. In-Game Shop: Collect MIPs in-game to unlock even more customisation options: more power-ups, buffs, costumes and trail designs available. In-Game Challenges: Win MIPs and level-up your characters as you complete in-game challenges. Play At Your Own Speed: Finding the game too taxing? Or simply not hard enough? No problem! Our procedural generation system is designed to tailor itself towards a variety of difficulty settings that allow you to play the game at your own pace. Leaderboards and Player Stats: See how you compare up against the rest of the Sure Footing community. Single and Multiplayer Challenge Modes: Play challenge levels for one or more players to win MIPs, rare costume sets, or just bragging rights! 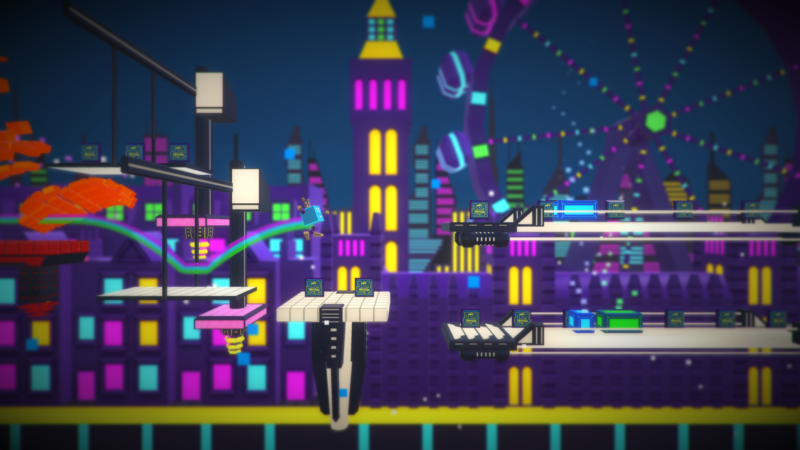 Sure Footing blends the best of both classic platforming and infinite runners into a fast and frantic arcade experience. Tommy Thompson is the designer and programmer for Sure Footing. Tommy is a senior lecturer in computer science and an AI researcher by day and games developer and YouTuber at night. You've maybe heard his dulcet Scottish tones over on the AI and Games YouTube channel. Tommy has spent years writing small games to test his research in machine learning algorithms as well as procedural content generation. He's taking inspiration from his academic work to procedurally generate the world of Computra one line of code at a time. Matthew Syrett has been reponsible for bringing much of the world of Computra to life. Matt has a broad career as an environment artist: ranging from working with oil companies to video game studios. He is now a lecturer in computer game art and hopes to impart at least some wisdom to the next generation of artists. Molly Freeman is Sure Footing's lead character artist and a graduate in computer game modelling and animation. She designs all of the character costumes as well as assisting Matt with the creation of some of Computra's distant zones. Charlotte Sutherland has been working as a 3D animator in the video games industry since 2007 and has worked on titles such as Sonic & All-Stars Racing: Transformed, Kinect Sports Season Two, Little Big Planet 3 and several entries in the LEGO franchise. Alongside her current work as a freelancer, she teaches university classes on game design and animation. Liz Rainsberry is a composer, musician, audio designer, and sound artist. Initially developing her skills as a guitarist, Liz now predominantly focuses on electronic music and sounds for animated and interactive media. Liz has previously scored titles such as Retool by Hit-90 Games and Hashtag Dungeon by Hitpoint Games and is currently working on 29 for Humble Grove and Outreach by Pixel Spill Games. We're really excited to bring Sure Footing to the world and by voting for us here on Greenlight you can really help us reach the huge audience of Steam users. Thanks so much for checking out our page! If you like the look of our game, please spread the word and share the link to our game. Visit the Table Flip Games Website. Subscribe to the Sure Footing YouTube Channel. You can also follow Tommy, Matt, Molly, Charlotte, Liz and Verena on Twitter. Join Pete, Polly, Blip and Plunk and outrun Deletion Dave across the disk sectors of Computra in our procedurally generated platformer in single player, multi-player and crazy costumes! Customise the way you play with a variety of power-ups and buffs that give you an edge over Deletion Dave. Play at your own speed and never play the same run of platforms twice with our extensive PCG system, to taxing change the difficulty with up to 4 different settings. Sure Footing on Steam Greenlight! Sure Footing just went onto Steam Greenlight! Fingers crossed. 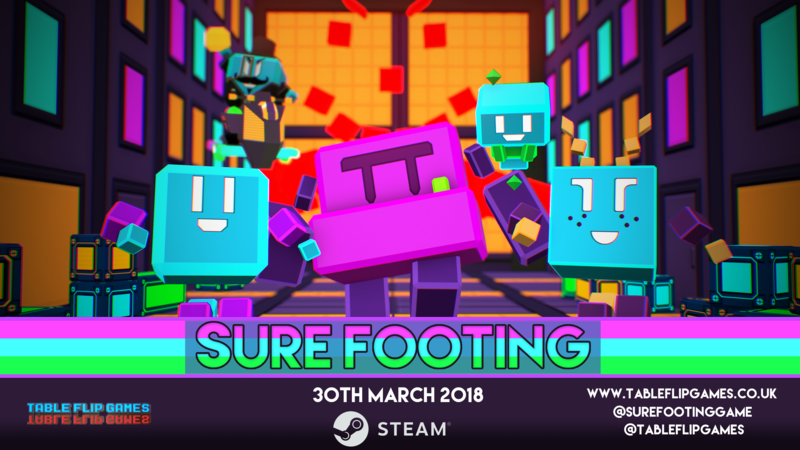 RT @sicklydove: @TableFlipGames's @SureFootingGame is a twitchy, neon, proc-gen endless runner out now on Steam, coming soon to Switch!